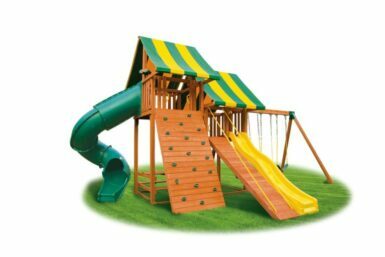 The Multi-Deck Series jungle gyms features a straight vertical structure, with multiple play decks. Bottom playhouses, built-in picnic tables and sandboxes are all options. Models include the Sky, the Fantasy, the Fantasy Tree House and the Imagination. Click the green circle on any 2 models you would like to compare. Deck Height: 7' and 5'6", Foot Print: 26' x 20', Total Height: 13'6"
Deck Height: 7' and 5'6", Foot Print: 24 'x 16', Total Height: 13'6"
Deck Height: 7' and 5'6", Foot Print: 24' x 16', Total Height: 13'6"
Deck Height: 7' and 5'6", Foot Print: 24' x 20', Total Height: 13'6"
Deck Height: 7' and 5'6", Foot Print: 41' x 28', Total Height: 13'6"
"I purchased the Dreamscape swing set in the spring of 2017. One of the best buying decisions I have made. The company defines customer service. From initial contact to installation of the swing set everyone was friendly, helpful and knowledgeable. The swing set itself is high quality. I appreciate that…"